Here at SeatGeek we can’t wait for all this training camp drama to come to an end, and for the NFL season to finally arrive. If we hear one more story about Brett Favre retiring, Darrelle Revis holding out, or Albert Haynesworth flunking his conditioning test, we will collectively vomit into our fancy, gold-plated garbage cans. In an effort to get even more geared up for the season, SeatGeek began a division by division preview of all 32 NFL teams, starting with the AFC East. (For a more in-depth explanation of our methodology, check that post here.) We now turn our gaze slightly westward, as we take a closer look at the highly competitive AFC North. Here at SeatGeek we place a lot of trust in the collective knowledge of the secondary market. While there are multiple factors that contribute to the resale prices of sports tickets, by far the most important is the quality of the product on the field. Fans are willing to pay more to see good teams than bad. (Check out the Minnesota Twins ticket profile page as an example of prices trending upwards as a result of inspired play, or conversely the Los Angeles Dodgers ticket profile page as an example of prices falling as a team falls out of contention.) With that in mind, We decided to take a look at all 32 NFL teams and rank them based on past performance and fan support, as determined by secondary market ticket prices. As one of the best divisions in football over the past decade, it seems as though every year three of the four teams in the AFC North are competing for a playoff spot deep into December. The Bengals and Ravens both improved their offenses this off-season, while the Steelers still have a solid team, and a hopefully refocused Ben Roethlisberger when he returns from his four game suspension. The Browns, perennially an afterthought, are also looking to contend this year with new quarterback Jake Delhomme, and explosive playmaker Joshua Cribbs leading the way. The Browns have been one of the worst teams in the NFL for a long time. Since rejoining the NFL as an expansion team in 1999 they have had a winning record only twice, and made the playoffs only once, in 2002. In 2009 the Browns went 5-11, and finished in last place in the division. However, their season ended on a high note, as the team refused to roll over and die. After starting the year 1-11, the Browns finished strong in December, winning their final four games of the year. 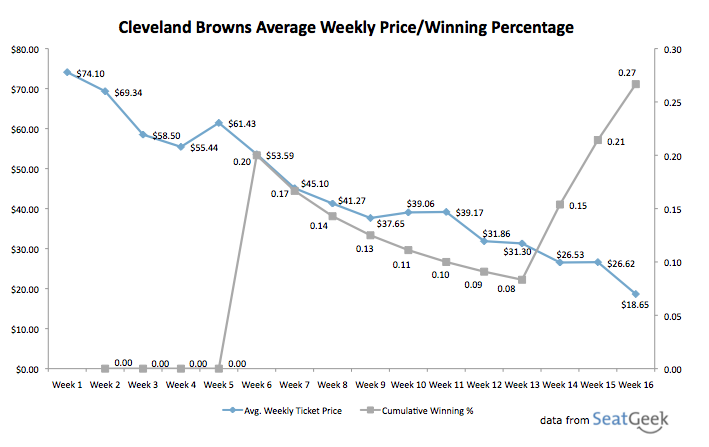 Despite their impressive string of wins in the waning weeks of the year, as shown in the chart above ticket prices for Browns games continued on their season-long downward trend. This is not altogether surprising considering how irrelevant the final games were. If the Browns hadn’t lost 11 of their first 12 games, we very well might have seen some fan excitement towards the end of the year. As it was, for all but the most hardy members of the Dog Pound, sitting on a coach and watching the Browns play was more than sufficient. Therefore, by the end of the season average prices had dropped to the obscenely low price of $18.65. To Illustrate this point, while the correlation coefficient between weekly average ticket price and the previous week’s cumulative winning percentage for the entire season was actually negative, at -0.74, when eliminating the first 5 weeks, in which winning percentage was 0, and the final 3 weeks of the year, when fans had already mentally checked out, the resulting correlation coefficient for games 6-13 is a solid 0.95. Although the Browns’ improved play did not appear to have an effect on 2009 ticket prices, we may be seeing some residual effects in expectations for the team in 2010. Browns secondary market ticket sales are relatively strong, ranking 17th out of 32 teams, with an average price of $96 over the past week, at time of publishing. This is higher than the Steelers, who are ranked 18th, and the Bengals, who despite winning the division last year, and making a splash by signing Terrell Owens, are still ranked 27th in the league in average ticket price over the past 7 days. Despite some positive signs, Cleveland fans shouldn’t expect the Browns to relieve the pain of Lebron’s departure. It’s going to be another long season on the shores of Lake Erie. The 2009 Bengals were hit by tragedy when wide receiver Chris Henry shockingly passed away in a car accident last December 16th. Nevertheless, the Bengals succeeded in not only making the playoffs, but holding off the Ravens and Steelers to win the division, before getting bounced in the first round by the New York Jets. The 2009 Bengals surprisingly won with a combination of defense and a solid running game led by the resurgent Cedric Benson. They were a far cry from the high-flying, pass-happy Bengals teams of years past. This year however, with the dynamic duo of Chad Ochocinco and T.O, Carson Palmer and Co. appear to become one of the most electrifying passing offenses in the league. 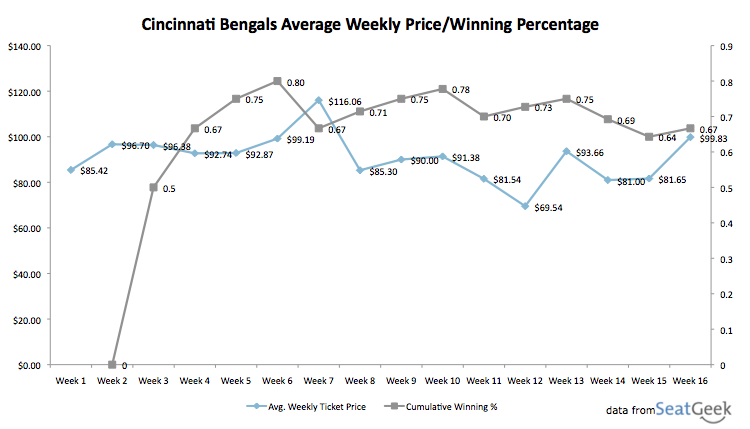 The 2009 Bengals highest average ticket price of $116.06 was during the week leading into Week 7 of the season, at a time when their winning percentage was 0.67, far from bad, but still not as high as it had been even the previous week. 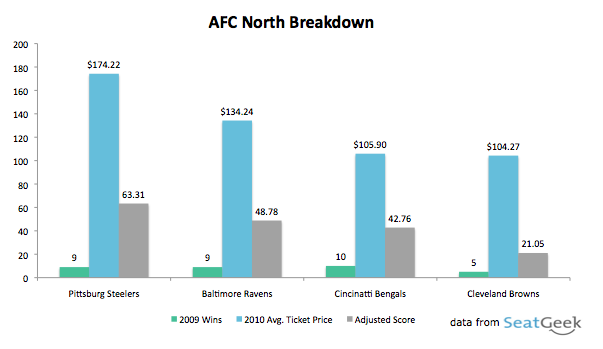 The correlation between ticket price and winning percentage for Cincinnati last year was -0.18, which is not high enough for us to infer any correlation between these two variables whatsoever in the case of the 2009 Bengals. Verdict: The Bengals had a good run last year, and have picked up an exciting play-maker in Owens, but lackluster fan support and uncertainty on the defensive side of the ball, will cause the Bengals to fall from first to third in this power-packed division. The Ravens, on the strength of second year quarterback Joe Flacco and young star Ray Rice, surged past the defending champion Steelers and stole second place in the NFC North last year to sneak into the playoffs as the sixth seed. However, they weren’t done there. They then proceeded to demolish Tom Brady and the Patriots in the first round, before losing to the Colts in the AFC Divisional playoffs. As is evident from the above graph, the 2009 campaign was an up and down affair for the Ravens; winning one week, and losing the next for the majority of the season. Average ticket prices on the other hand, followed a more volatile and less predictable pattern. 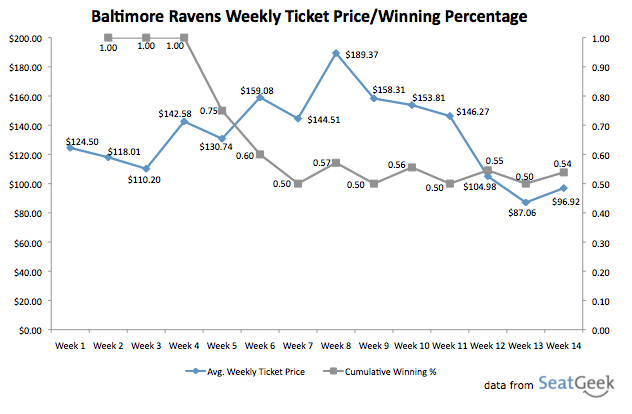 After starting off the season at a healthy $124.50, prices climbed to a peak of $189.37 midway through the season, before inexplicably dropping off as the season wound down, with average prices for the Ravens’ final home game at $96.92. Similar to the Bengals, there was no strong correlation between weekly prices and winning percentage for the Ravens in 2009, with a correlation coefficient of -0.16. Verdict: Consistently strong play on the field, combined with strong sales on the secondary market make the Bengals a strong contender in the AFC. With new star wideout Anquan Boldin in the fold, the Ravens should make it back to the playoffs once again in 2010. In 2009 the Pittsburgh Steelers went from Super Bowl Champions, to Steel City Chumps, finishing at 9-7 and missing the playoffs. This offseason has been a tumultuous one for the Black and Gold, with pro-bowl quarterback Ben Roethlisberger fighting sexual assault allegations, and troubled former Super Bowl MVP Santonio Holmes getting traded to the Jets for a 5th round draft pick. Nevertheless, 2010 Steelers ticket prices remain high on the secondary market. Since going on sale, they have traded for an average price of $174.22, far and away the highest of any team in the AFC North, and a big part of the reason why we have picked them to bounce back and win their division this year. 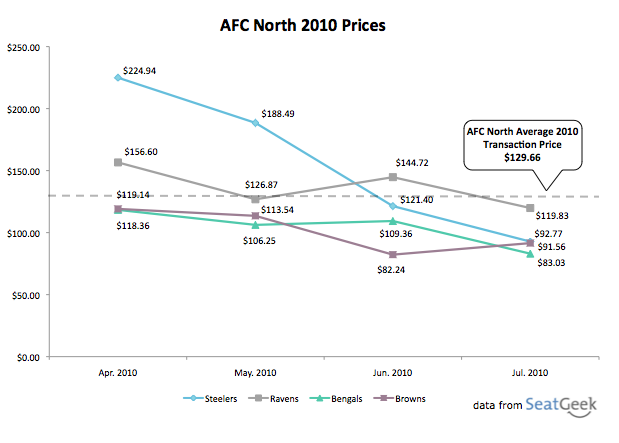 In 2009 the Steelers had both the highest average ticket price in the division, and also the prices that conformed most directly to fluctuations in the team’s on-field performance. With a correlation coefficient of 0.45, there is a definite, if not altogether perfect, correlation between team winning percentage and weekly average ticket price. 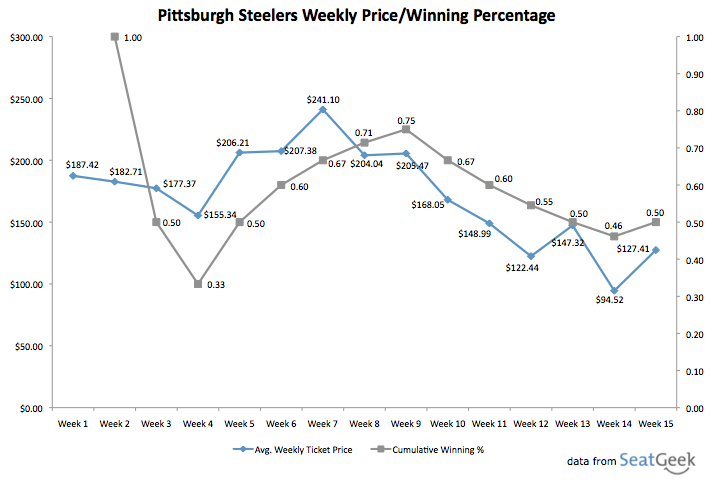 As the Steelers won 5 games in a row to improve to 6-2 through the first half of the year, ticket prices rose to a high water mark of $241.10. However, as the team began to fade in the second half, ticket prices trended downwards as well. hitting a low point of $94.52 in Week 14. Fans in the Steel City should have their terrible towels out and waving proudly, as the Steelers will return to their accustomed spot atop the AFC North for the fifth time in the last nine years. It is also interesting to note, that across the four teams in the division, three of the four had significant downward price trends over the second half of the season, with the only exception being the division winning Bengals. Perhaps we can infer from this that initial excitement for football season dies down over the course of the season, or maybe it’s just that as the weather gets less pleasant, fans are willing to pay less to sit in the brutal cold of cities like Pittsburgh or Cleveland. And with an average price of only $129.66 for the division as a whole, don’t hesitate to grab the grill and head out to the stadium on any or every Sunday this fall for some great AFC North style football. Stay tuned to SeatGeek for more of the latest NFL trends, and for the rest of our NFL previews.